The grass is turning a little bit greener and the buds will soon begin to bloom. As Mother Nature prepares to greet spring, chefs throughout Canada and the Northern US anticipate the arrival of locally grown produce into their kitchens. Among the first of the deliveries will be all sorts of mushrooms, foraged in the forests to add some meatiness to meals. From morels to oyster mushrooms to chanterelles, there are so many delicious, safe-to-eat, varieties just waiting to be enjoyed. A huge variety of mushrooms are available and choosing the right type to go with your next meal need not be a difficult decision. Most mushrooms pair nicely with the majority of dishes but before the cooking process can begin, it’s best to know how to select them. When buying from a store always make sure mushrooms are firm, slightly shiny and have the same colour throughout. If you are feeling adventurous and want to head out into the woods, we suggest consulting a guide to ensure that you only pick mushrooms that are safe to eat, as many varieties can be poisonous. Once you have purchased or picked your mushrooms, the cleaning process begins. Mushrooms are extremely delicate and need to be handled with care. Pre-packaged mushrooms should be stored in the fridge while those sold or picked individually should be kept in a brown paper bag in a pantry to ensure they stay firm longer. Either way, mushrooms will generally stay for up to a week but should ideally be eaten within a few days of purchasing/picking. Mushrooms should only be washed prior to immediate use, not beforehand. They can be wiped with a damp cloth or rinsed in cold water and patted dry. 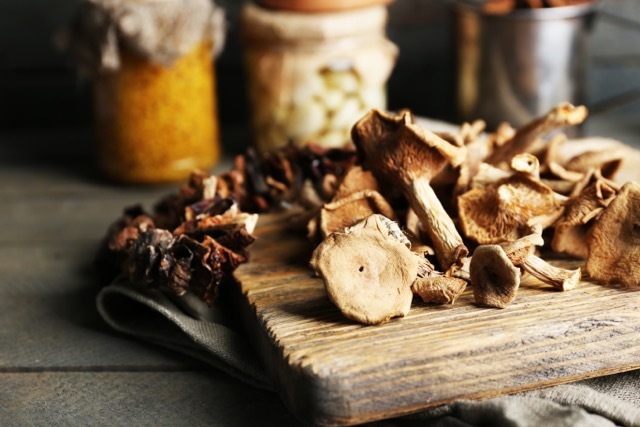 Extremely versatile, mushrooms not only add an extra dimension to a meal they also give your body a boost. Low in calories and fat, these little fungi pack a punch of vitamins and antioxidants. They are also the only vegetable that contains Vitamin D, helping to make bones stronger. On this week’s menu we’re featuring some of this homegrown goodness. A dish that the entire family will adore is our seared salmon, served with fried rice with shitake mushrooms. We’ve also included porcini mushrooms as the basis for the sauce in our sirloin steaks with sautéed vegetables. Not that you need an excuse to have more mushrooms, but the arrival of spring makes eating them that much more enjoyable and fun to cook with. They are called “fun-guys” after all!